Lufthansa First Class remains my favorite way to fly. Not only is it an aspirational experience, but also an easily reachable one. Earlier this year I enjoyed an incredible flight in Garuda Indonesia First Class which was absolutely amazing onboard, but lacking on the ground. 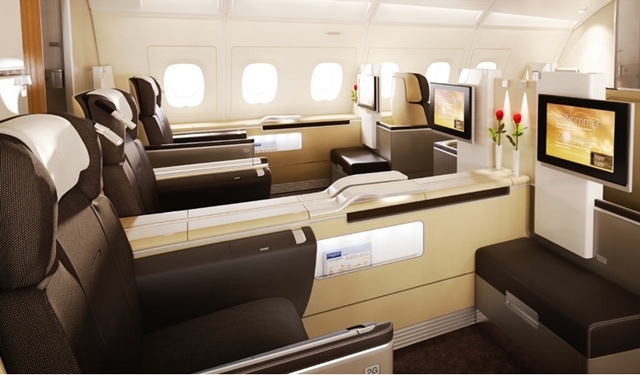 Air France and SWISS both offer remarkable first class products as well. But when price plus ground experience are factored in, Lufthansa still comes out on top. Lufthansa First Class remains aspirational, yet is reachable without spending thousands of dollars of hundreds of thousands of points. In fact, Lufthansa First class is downright cheap if using the right currency. Asiana Club is the loyalty program of Asiana Airlines and also a Starwood transfer partner. Although it is overdo for a devaluation, Asiana charges only 50,000 miles one-way for a first class ticket between the USA and Europe. Starwood provides a 5,000 miles bonus for every 20,000 miles transferred, most on a 1:1 basis. That means a one-way first class ticket on Lufthansa booked with Asiana is only 40K Starwood points. That’s a incredible deal considering Aeroplan charges 70K one-way and United charges 110K one-way. My friend John has been trying to use his Asiana miles to get to/from Europe in Lufthansa First Class for over a year, to no avail. While Lufthansa is good about opening up last-minute award space in first class as much as 14 days in advance, often it opens only a day or two before. With Asiana, that is too late. So you really need to plan in advance and be flexible if you want to take advantage of this great deal with Asiana. First, your points have to be in the account before you know if space will open. Second, space must open more than three days prior to travel. For west coast travelers, I find that increasingly difficult (especially since first class is no longer offered on the Frankfurt – Seattle route). But for midwest and east coast travelers, getting first class from New York or Washington a few days in advance is generally doable. Lufthansa First Class remains attractive not just because it represents a great onboard product with great ground experience, but because it is relatively easily reachable with your miles. Use Asiana and you’ll pay less for first class then you will for business class on many carriers. Topic is 40k miles which is not correct.It is 50k in OZ miles but 40k in SPG points. Other than that,LH F wit A3 points EU-ME is 45K miles,lot of choices except UAE at the moment due to the aircraft configuration. Not convertable from SPG, TK miles to EU-ME in LH F is only 35,5k miles and to Kazakhstan 43k miles one-way. On some days LH flies to Alma-Ata through Astana,so basically two segments. 40K Starwood points — you cannot beat that for a transatlantic first class ticket on Lufthansa. Thanks Paulista. I agree the title was misleading. Kinda annoying actually. Thanks for the additional information. Do you know where the best place to search award availability is? What is misleading about the title? 40K SPG points IS the price. Search on Aeroplan or United website for space. Beware of phantom space. There is no source online with 100% accurate space. Paulina’s discussion on first class routing from Germany to the Near East is irrelevant — I am talking about transatlantic space. United website is the best to search for Lufthansa awards other than their website. LH F opens usually 14 days before the flight. In the topic was not mentioned in which town it is a best deal. Therefore I wrote about the best deal in EU(Frankurt for example)from where the transatlantic deal is not the best, specially to East Coast. Availability to ME and NE is much more easier to find than to North America. I redeemed SQ miles for LH F to ME and it was also cheaper than transatlantic to East Coast. But I like the OZ amount of the miles, but to find available seats is quite difficult. U are misleading others and continue to insist u r not talking nonsense. This is like saying a 100000 miles is now 80k. Click bait. Talking miles vs miles and not miles vs starpoints. Commenters above me also gave the same feedback. Is this still from 2014? Can you add on an intra-Europe zone 1 flight for no additional miles? Can you also add a positioning flight on UA within the US? Thanks. I have never known anyone to get their SPG points transferred over to Asiana in 3-4 days. Generally it takes between 7 and 14 days with some data points on flyertalk showing even longer times. Did you actually get your points transferred in 3 days? ?